The installation of the cyberREN system will bring the operation of a facility on to a new plane, taking advantage of information technology and the automation of various clinical and administrative tasks. This progression is expressed through changes in the facilities operating policies and procedures, which come into effect when cyberREN usage commences. This revision of policies and procedures is accomplished through a review of current procedure combined with an introduction / presentation of corresponding cyberREN features and functions. Recommendations for improvement are presented by qualified CML staff in context of a user forum, a consensus is built, and the basis for procedure revision is determined. At the time that the conversion to the cyberREN system takes place, clinical staff of all disciplines will have a clear concept of not only how to use cyberREN, but also how to integrate cyberREN usage into their new workflow's. 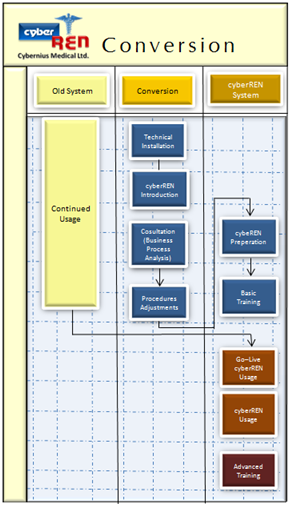 the functions and capabilities of the cyberREN system, and the methods of accessing and creating medical records. This knowledge is delivered through a cyberREN Training Program. This review is accomplished through user forums on site, to which each discipline brings their current documentation format. The entire patient treatment cycle is reviewed, from the perspective of the involvement of the discipline in the patient’s treatment. Alternatives to the current care/documentation process enabled by cyberREN are discussed and resolved. This results in new, streamlined procedures as well as the elimination of most if not all paper documentation.